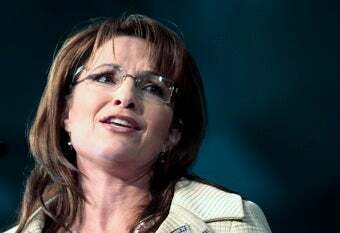 Taking to her Facebook page to complain about work done by actual politicians, the super-profesh Sarah Palin once again warned Americans that they'd be facing "death panels" due to the passage of the health care reform bill in the House. Palin posted several rants yesterday, most of them aimed at House Speaker Nancy Pelosi, for wanting to push the bill through by midnight. "Why the rush?" Palin asked in a note titled "Speaker Pelosi, Your Blue Dogs Are Barking," "That's a lot of pages to read. Why not give everyone the chance to read it and debate it?" All of us who value the sanctity of life are grateful for the success of the pro-life majority in the House this evening in its battle against federal funding of abortion in this bill, but it's ironic because we were promised that abortion wasn't covered in the bill to begin with. Our healthy distrust of these government leaders made us look deeper into the bill because unfortunately we knew better than to trust what they were saying. The victory tonight to amend the bill and eliminate that federal funding for abortion was great – because abortion is not health care. Now we can only hope that Rep. Stupak's amendment will hold in the final bill, though the Democratic leadership has already refused to promise that it won't be scrapped later. We had been told there were no "death panels" in the bill either. But look closely at the provision mandating bureaucratic panels that will be calling the shots regarding who will receive government health care. Despite Americans' decisive message last Tuesday that they reject the troubling path this country has been taking, Speaker Pelosi has broken her own promises of transparency to ram a health "care" bill through the House of Representatives just before midnight. Why did she push the 2,000 page bill this weekend? Was she perhaps afraid to give her peers and the constituents for whom she works the chance to actually read this monstrous bill carefully, if at all? Was she concerned that Americans might really digest the details of a bill that the Wall Street Journal has called "the worst piece of post-New Deal legislation ever introduced"? I don't know, you guys. I mean, maybe Speaker Pelosi was afraid that Sarah Palin would totally read the bill after she finished reading all the newspapers and magazines and she just wanted to push it through so she could be all "Oh, Sarah Palin, don't you have some designer suits to return? Oh snap flowchart: women in politics edition." Most likely, however, Speaker Pelosi was less concerned with Palin's death panel fearmongering conspiracy theories and more concerned with trying to take the steps necessary to eventually provide coverage for millions of Americans. Feel free to add your own conspiracy theories in the comments.